It’s launch day at last! 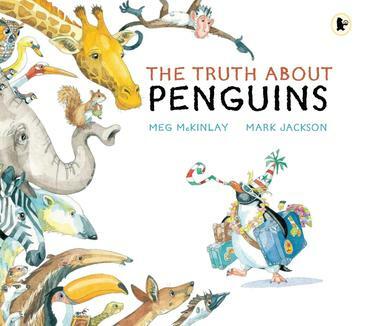 Following relatively hot on the heels of the publication of Duck for a Day, I’m very excited to announce the launch of my first picture book, The Truth About Penguins, featuring illustrations by the copiously talented Mark Jackson. There will be no official launch as I am still in Japan. This is perhaps fortunate as it has made it easy for me to resist the temptation to hold a joint launch party for both books under the banner “Two Birds, One Stone”, a slogan which may have traumatised small children. The official blurby thing is copied below and you can visit my website for more book-related details. This book had an interesting path to publication and I can safely say it would still be a pile of disconnected notes stuffed in a drawer somewhere if it weren’t for the vision of my editor, Sue Whiting, and the wonderful team at Walker Books Australia. Thanks, all! Everybody knows penguins … don’t they? The penguins are coming and there is great excitement at the zoo. But what’s a penguin? The animals don’t quite know what to expect – but they all have an opinion, each more outlandish than the last. When the truth about penguins is finally revealed, everyone is in for a surprise! The Truth About Penguins is a zany romp that plays with the fine line between fact and fiction in the animal world. The detailed, expressive illustrations by Mark Jackson will have children searching each page for added fun. This entry was posted in Picture Books, The Truth About Penguins and tagged Japan, shiny new book on July 1, 2010 by Meg McKinlay. Looks like the penguin is celebrating your success! Congrats, Meg. I can't wait to read that in bed to the kids on one of these frosty cold Perth nights. Prrrrrrfect. Thank you my dears. I would love some of that champagne and perhaps also a little of your cold. We are well into the rainy season here and things are *steamy*. Congratulations! I'll be keeping a sharp lookout for your little penguin friend. My boys will love it! Thanks, Karen! I hope they do! Meg, this looks fantastic, and what a great front cover that is! I will keep my eye out for it in the shops. I love the 'two birds, one stone' idea personally and think it's a shame you can't use it. Looks like another great book, Meg. I can't wait to get my hands on it and look inside.